"Suite for Ztar and Orchestra in G Minor Op.1 No. 1" takes the Classical music compositions of Les Fradkin and Interweaves that new music with themes from Johann Sebastian Bach into a 21st Century Symphonic Suite. A new dawn of Classical Compositional Technique. Plus the arrival of a revolutionary brand new Classical Solo Instrument- the Starr Labs Ztar. The Composer performs every Orchestral part on this breakthrough recording, triggering all sound from the Starr Labs Ztar. Les Fradkin is a 21st Century "New Media" Artist and Composer / Innovator on the Starr Labs Ztar and a virtuoso MIDI Guitarist. A brand new playing Technique which discards the traditional Chromatic Scale, meets 21st Century electronics in a Symphonic meets Rock format for One Man Orchestra from the Pioneer of MIDI Guitar and Tapeless Recording. New solo Beatles Instrumental CD!!!! Featuring Les Fradkin on the Starr Labs Ztar! 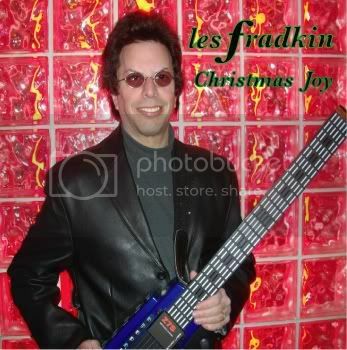 Les Fradkin - "Christmas Joy"
"As many of you know, over the years, many music critics have called me a one man band. And yes, it's true that I play all the sounds you hear on this CD, as I have many times in the past throughout my recordings. I've always looked for new ways to make electronic MIDI Guitar a more expressive instrument. As always, I've strived to take MIDI Guitar to the next level. My newest recording, "Hyper MIDI Guitar", is my first ever where I play ALL the guitar and bass parts entirely from my Starr Labs Ztar triggering a completely customized sample library which I've assembled for this project. With admirable restraint, I can say- I did not pick up any of my guitars or basses to record this CD. And I'm very pleased and surprised with results. Enjoy!" "Baroque Rocks! ", the hit Les Fradkin Ztar album, is now available for purchase at amazon.com and iTunes. IIt's a blend of Progressive neo classical rock and baroque music featuring Vivaldi, Handel, Bach and new composers. If you like Yngwie Malmsteen, ELO, Vivaldi, Steve Vai and great Baroque music, this is for you. And the main attraction is Les Fradkin and his remarkable Starr Labs Ztar. STRESS SOLUTION: Next time job stress has you gnashing your teeth, try listening to Vivaldi, Handel or Bach. These composers are all covered on "Baroque Rocks!" A just released study reveals that listening to music composed during the 17th Century (Baroque Period) can boost your mood! Contains the hit single "Canon In D". at the dance floor. Has Radio edit and full extended mixes of "The Gates Of Trance" and "Go". "The Space Rock sound everyone is talking about!" What happens when you combine elements of Progressive Rock, Space Rock, Electronic and Neo Classical? All controlled by the amazing and expressive sound of the Starr Labs Ztar? "ONE LINK BETWEEN THEM." Featuring "Telstar" and the Internet and YouTube Hit single "Lift Off". This is the Les Fradkin single from his CD "One Link Between Them." Featuring the amazing sound of the Ztar from Starr Labs. Les opens 2008 with his exciting version of the legendary smash hit "Telstar." Listeners will be caught up in the dramatic sound of the Ztar- a futuristic MIDI Guitar which controls synthesizers, computers and sequencers in undreamed of ways. Arturia Moog Modular V, Logic ES2 and Mellotron take the lead in this exciting version of "Telstar." And follows that with a Ztar MIDI Guitar instrumental of Queen's "Bohemian Rhapsody." Queen fans will be very taken with this instrumental performance. This version of "Bohemian Rhapsody" is only available on this Download only single. As a bonus, another track from the "One Link Between Them" CD is "A Dim Twilight." Les controls the GForce M-Tron in a gripping performance.